For one reason or another, seeing unique phenomena in the place you call home makes the event even more special. 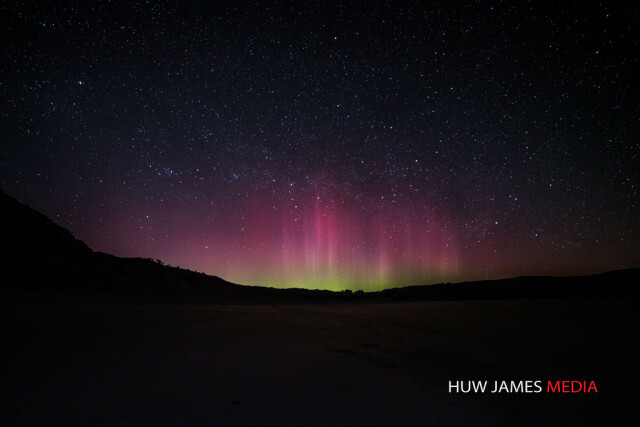 I’ve seen solar eclipses, lunar eclipses, meteor showers and the northern lights – all from my home country of Wales. Obviously the aurora aren’t as spectacular or breathtaking as you’d find further north but even getting a glimpse and capturing them on camera is special when it’s from home. 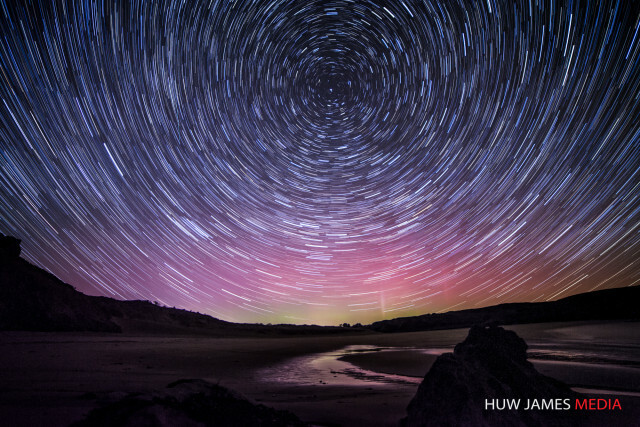 Startrails over Wales with the aurora behind. I’m lucky to live relatively close (1hr drive) to the Brecon Beacons National Park, which is a Dark Sky Reserve. 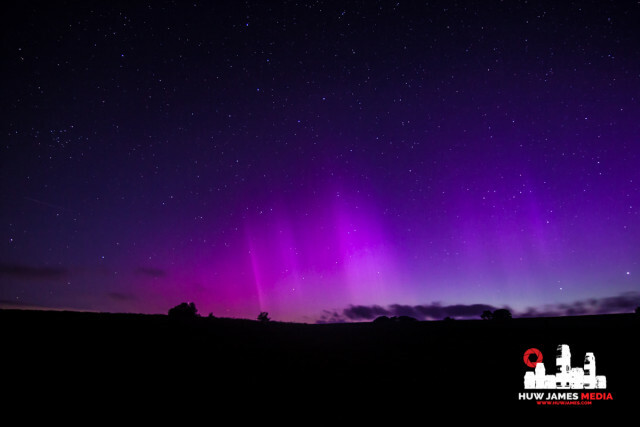 With information services now sending out updates and alerts on the strength of geomagnetic storms there’s all the chance in the world that when you get a storm alert come through, and head somewhere dark, you’ll see aurora in the UK. Both of these photos were exactly that, you see something in the sky, could it be aurora? Take a photograph and there it is! I jumped around both times, once in the Brecon Beacons and once in Pembrokeshire. Wales is unique as it’s pushing to be a dark sky nation with 2 of our 3 national parks being Dark Sky Reserves. A new project coming out called Discovery in the Dark will hopefully push the idea that dark skies are better for many reasons, the aurora being just one. But a really amazing one. Dark Sky Discovery Sites are spectacular stargazing sites perfect for astronomy and free from the worst effects of urban light pollution. Each Dark Sky Discovery Site has been nominated by a local group or organisation and approved by the Dark Sky Discovery programme as accessible, with good sightlines and relatively low light pollution, giving people the best possible conditions to just turn up and see the stars (and maybe even the aurora) on a clear night. Dark Sky Discovery is a network of astronomy and open space organisations that aims to encourage people of all ages and backgrounds to get out and stargaze. Many of these organisations run events where the public has the opportunity to meet astronomers and find out about the latest astronomical discoveries. The Dark Sky Discovery map highlights Dark Sky Discovery Sites and other venues that will be running events through the winter. You can get some stargazing tips from Huw James in his post for the Cotswold Outdoor blog.